Back at the April 2013 Marketo Summit, we were all blown away by the prospect of using the Engagement Program. The Engagement Program abstracts away all of the logic required to run a Traffic Cop style nurturing system, which Marketo developed. Edward Unthank later differentiated between Traffic Cop and Traffic Director, and how to take your lead nurturing to the next level. The Engagement Program solves much of the issue around tracking leads through the system, moving them between content tracks, content exhaustion, and the delicate logic to keep the right people in and out at the right times. So does it work? Streams are analogous to the old “nurture track” method. Except that now Streams can have a Cadence (or timing) and you can easily drag and drop emails in any order, removing, archiving, and adding without having to do anything special to keep the Stream moving. You can have multiple Streams and clone them too. Cadence defines how often to send the emails in the order you created. It can be every day, week, etc., based on the timing you setup. Unfortunately, you cannot currently vary the timing between content, say if you wanted 7 days, then 15 days, then 7 days. To do that, you could use two streams and set the Transition Rules to pull the lead back and forth based on Delivered or Sent Email trigger. Transition Rules – multiple Streams will require a Transition Rule, just like the old Traffic Cop system needed to listen for the right change for a lead to move in/out of a track. Now the Transition Rule does it for you. Transition Rules will bring up a Smart List and Flow tool. You must have a Trigger to activate the Rule. The critical part is to click on Stream 2 or Stream 3 – the Stream you want to pull a lead into. All you have to do is decide which Trigger(s) will make a lead move over to the next Stream. Perhaps a couple of clicks? Perhaps no engagement? Or Perhaps they became part of an Opp and now you want to send them Late Stage Content. Marketo handles the rest. Engagement Level helps you automatically determine how effective your content is by taking into account Opens, Clicks, and Program Success vs. Unsubscribing. Exhausted, like other examples, Marketo will set a lead to Exhausted once the Stream runs out of content. You can keep adding content or set rules for leads to follow once content runs out. Exhausted Leads can be reactivated if you add content to the Stream. Casts – this refers to the email send. Each Send becomes a Cast (since we are fishing for engagement). Local Reports – Wow! In addition to creating the standard reports, you can now create an Engagement Stream Performance report, local to the Program. This report functions a bit like the Email report in that you can select emails or Streams. 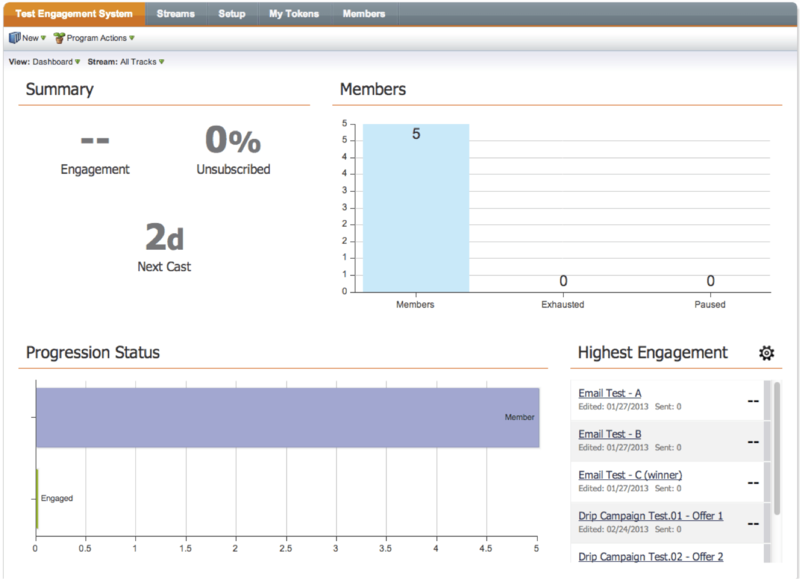 It will show stats for all email deliverability metrics by Stream and Email as well as overall. Summary Dashboard – go to the Summary and then change View to Dashboard. You will now see a quality dashboard for the entire system, including the next Cast (email send), Members, and Engagement scores by email and members. You can further filter by Stream. Archive an email to remove it from being Sent while retaining the data. Content Availability – you can now schedule emails to send only during a certain timeframe, such as a webinar or event invitation. 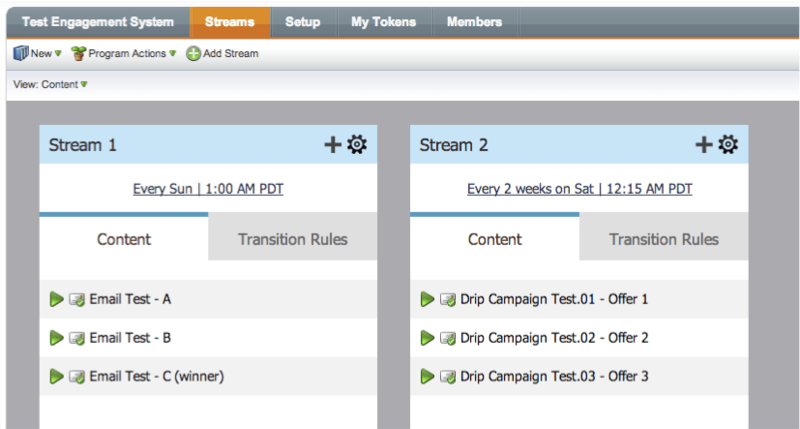 You can Pause or Remove Leads from Streams or Engagement Programs using the flow action. Turning Off the Engagement system will stop all Casts/Sends until reactivated. You can bring in Assets from Design Studio, Programs, and Emails internal to the Engagement. Dragging and dropping from the left-hand tree is allowed! You can create Local Emails, Pages, Reports, and Even Programs. You can test the system by using Add to Engagement Program flow action on one or more test leads you determine. This saves a ton of effort from the old way: Clone and Restrict! You can add an entire Program to an Engagement Stream. If you have existing drip nurturing Programs, you can keep using them. Engagements also have a Setup like any Program. Add your Period Costs and SFDC Sync here. My Tokens work just like they do elsewhere, including bringing in tokens from folders above the Engagement. Members also work the same. Views: you can adjust the view to show Stream data by Lead or Engagement or by Content. These provide helpful data points. AB Testing Emails – this is done by creating a Program Smart Campaign to run the test between different emails. Add that Program to the Stream. Communication Limits will throttle email frequency regardless of the Cadence you set. The Engagement System acts like a giant Program with special tools. Compared to other marketing automation tools, Marketo provides an easy-to-use nurturing system. For firms who make complicated nurturing a centerpiece of their demand gen, Marketo is now the first choice. Of course, if you still use basic drip and have a small budget, there are always other options. If you’ve used Engagement successfully, tell us about it below. You mentioned, “Perhaps no engagement?” in your Transition Rules area. How would you trigger a lead who consumed all content from one stream to be placed into the new stream? I imagine the Smart List criteria in the Transition to leverage “Program Status is Changed”? What other trigger can be used once a lead exhausted all content in a stream for them to be “enrolled” in the new one? Building my first Engagement Program. I get most all of it however, it occurred to me after I had built all the framework … how does it know which list to send to? I have three industry segmented lists which, with the launch of this new engagement program, will be segmented further with 2 title based personas. So i figured 6 smart lists total. My design is 4 separate programs …. 3 Engagement Programs (one for each industry) with 4 Streams each (an Early Stage per persona and a Late Stage per persona). 1 Strategic Engagement 3 Streams for accelerated leads in the late Consideration Decision stage. It looks good on paper. Can this design work? If so … How do I assign lists to each stream? My plan for the Engagement Programs is 4 emails per stream with all streams on a once a week cadence. When the early’s runs out the late’s kick in. As leads convert via contact us or request a meeting they are moved to SE. Whoever is left at the end split off according to activity and score …. some go to Strategic Nuture and the rest go slow drip. Will this design work? I appreciate your help and the peer review of my first design attempt. Thanks! -One Engagement per Industry is fine. -Sounds like you only have 2 Streams per Engagement…not sure where 4 comes from. -You can START with 4 emails. don’t limit yourself. The system is designed to take in more emails. -Think of your Entry (lists), Goal (what do you want them to do? – this is also your Exit. You should only move people to a new Stream if they took the appropriate actions. Don’t move people just because you run out of content.